[FREE IRAN Project] In The Spirit Of Cyrus The Great :: View topic - New disturbance in Iran! live broadcast from KRSI! New disturbance in Iran! live broadcast from KRSI! Posted: Sat Oct 07, 2006 6:20 pm Post subject: New disturbance in Iran! live broadcast from KRSI! KRSI reporting escalation of situation around Mr. Broujerdi's residence! new clashes have been reported and wave of population is rushing towards Mr. Broujerdi's residence to participate in resistance! Mr. Broujerdi is defending the idea of seperation of religion from state and is being attacked by forces of evil islamic terrorist regime! Posted: Sat Oct 07, 2006 6:49 pm Post subject: Re: New disturbance in Iran! live broadcast from KRSI! liberty requires sacrifice and bravery! liberty has a price and no one should wait for others to come to liberate them! liberty does not come free and anyone wishes that should work hard for it! liberation of a nation from tyrany of any kind will not be easy! supression forces will always be there! this should never be an excuse for the those who rather die than live with disgrace of islamic terrorist regime which is driving our nation towards the ultimate disaster of nuclear confrontation! it's timee for action and no time for excuse! Due to very difficult circumstances of freedom-loving Iranian people for freeing their homeland from Islamic Fascists, lack of real support and undelivered promises in past for FREE Iran, Free Society and Secular democracy from �., The freedom-loving Iranian people resistance movement against Islamic Fascists inside Iran should enter the phase of organizing themselves as individual or in small groups of 3 to 5 individuals secret cells and avoid creating very connected large organization with single leader or leadership council or hierarchy that can be brought them down by Islamic Fascists Security Forces�.. and based on nature of these cells activities and specialties should avoid to become public and be exposed as long as possible to avoid arrest and executions by Islamic Fascists with vast Oil Money resources and traitor security forces�. these cells must have flexibilities to adapt to new circumstances and unexpected events because the external events can not be predicted very easily and avoid setup protest and NGO traps by Islamic Fascists security forces. Always hit your enemy with the element of surprise where they don�t expect �. The War against Islamic Fascists (Taazim) and beyond have many dimensions, complexities and there is no single dimension and strategy that should be considered as the only solution, The leadership is important in mature and well established free societies in Free World �. and less important in underground resistance movement in today Iran with lack of massive financial resources � Today freedom-loving Iranian people have their advantage that they know their enemies well, and many of their weaknesses, and we have clear unity of vision for FREE Iran, Free Society and Secular democracy and element of surprise is the key to success. The power of individuals and small groups are far bigger without much control from above �.. The freedom-loving Iranian people underground resistance movement should have Guerilla, Cultural, Arts, Information, Respect for Past Heroes �. attributes and elements , and some of these activities can not be considered as peaceful because Islamic Fascists by its nature is not peaceful at all and be prepared for long battle to destroy all aspects of Islamic Fascists completely, and beyond its fall � and don�t rely on any outside free world governments (USA is the only G8 exception that followed different policies during past 27 years ) because they can sell their own soul for cheap barrel of Oil (France, UK, Germany �. ), based on yesterday and today facts and experience no free world governments can be trusted easily and they can change direction with wind changes. So far the Freedom-loving Iranian people (Political Prisoners, Scholars, Writers, Artists, Singers, Workers �.) have executed the intuitive cultural warfare in distributed and independent manner both outside and inside Iran and we have won successfully the cultural war against Islamic Fascists (Taazi) in Iran completely and today all forms of Islam in Iran is dead and we are entering the phase of throwing these rotten Islamic Fascists dead bodies to the dustbin of history forever �.. The Islamic Fascists currently are living on life support of Oil Blood Money, External Crisis, and Outside Terrorists in the Middle East and live in the past dream of deceiving Iranian people and can not see that they have lost all their power basis, it is just matter of time to loose all controls �..
TEHRAN, October 7, 2006 (RFE/RL) -- Several hundred supporters of an outspoken cleric in Tehran, Ayatollah Kazemeyni Boroujerdi, gathered today in the streets around his house to protest what they described as violation of "freedom of religion." Protesters told Radio Farda that they were trying to prevent the arrest of Boroujerdi by security forces. Boroujerdi advocates the separation of religion from politics. One of his supporters told Radio Farda that during the past two months there have been several attempts to arrest the ayatollah. "[Security forces] took away his daughter and 38 others two months ago, they've freed them but they came this morning to take away [Boroujerdi] but the neighbors didn't give in," the man said. "They came again later to arrest him but his supporters have gathered here and will resist. Thank God, we're many, about 2,000 to 3,000." Iran's ILNA news agency reported that police used tear gas to disperse the protest but protesters resisted by burning tires to counteract the effects of the gas. Over the last 3 days of severe unrest in Tehran many activists and anti-regime groups who were present only to record and report the events, have also been arrested. The unrest was triggered by the arrest of the Ayatollah Kazemeini-Boroujerdi and his followers, all who call the regime an illigitmate government and demand for the separtaion of religion and state. Hours after the end of the street fighting, on Saturday night, October 7th, there is still no information on the status of esteemed activist and blogger Kianoosh Sanjari who is also a member of students� united front. Sanjari who had gone to the residence of Ayatollah Kazemeini-Boroujerdi to prepare a report was arrested along with the Ayatollah�s supporters and was transferred to an unknown location.? Reportedly, all these disappearances were enforced and overseen by NAJA, the secret police bureau for combating social corruption. During recent days hundreds of the Ayatollahs� supporters have been arrested and taken to the infamous detention center 209 of Evin prison which is overseen and run by the agents of the ministry of intelligence and security. It is possible that Sanjari has also been transferred to this ward. Also according to eye witnesses, a large number of people who were involved in the street fighting and major clashes with the regime�s disciplinary guards who had surrounded the Ayatollah�s residence, were severely injured and were delivered to the Imam Khomeini hospital and other area hospitals. Unfortunately we have noticed possible arrest of 23-year-old Mr. Kianoosh Sanjari again as human right reporter on Sunday clashes. 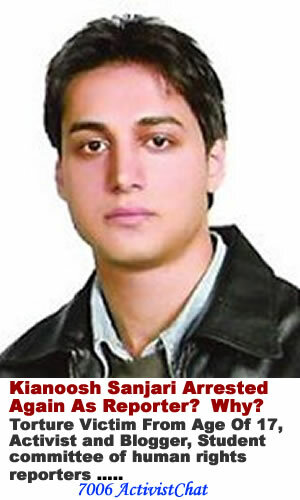 What is special in this arrest that Mr. Kianoosh Sanjari is an Iranian student activist who has been arrested and incarcerated several times in the last several years. On 29 April 2004 Sanjari told RFE/RL he was subjected to psychological torture while incarcerated. "For a youngster like me who was arrested at the age of 17 and put into prison, solitary confinement for several months was probably the worst psychological torture, and many [who were subjected to the same treatment] wished to die," he said. [b]Despite the fact that ActivistChat has nothing in common with Ayatollah Boroujerdi, this recent event has proved the truly vicious and totalitarian nature of the Islamic Fascists occupiers of Iran that has 0 tolerances even towards their own fellow clerics, this might be good lesson for those G8 countries that acting as blinds and deaf to open their eyes to the reality after 27 years appeasing. According to unconfirmed report by Dr. Michael Ledeen �that speak of more than seven hundred people murdered on the road to Qom ...� This is another indication that D�tente with Islamic Fascists is the EU3, China and Russia illusion and far from reality. TEHRAN, Oct. 8 � A senior cleric who opposes religious rule of Iran and a number of his followers were arrested Sunday after clashes with the riot police over the weekend, news agencies reported. About 1,000 supporters of the cleric, Ayatollah Mohammad Kazemeni Boroujerdi, gathered outside his home and on the streets leading to it on Saturday, the semiofficial ILNA news agency reported. They were there apparently to protect him from arrest and to protest the arrests over the past month of other supporters who had tried to protect him after a court had summoned him. Another news agency, Entekhab, also reported that Ayatollah Boroujerdi and some supporters had been arrested. News reports quoted officials as saying that members of the crowd came armed with knives and daggers, and the reports said the riot police used tear gas to disperse them. Ayatollah Boroujerdi said that he had written to the United Nations secretary general, Kofi Annan, to the European Union foreign policy chief, Javier Solana, and to Pope Benedict XVI and others seeking protection and asking them �to make efforts to spread traditional religion,� separate from politics, ILNA reported. �I believe people are fed up with political religion and want traditional religion to return,� ILNA quoted Ayatollah Boroujerdi as saying. Protesters who were interviewed on opposition radio and satellite television channels Saturday said that the supporters of Ayatollah Boroujerdi were prepared to die in his defense. The Iranian authorities are wary of any challenge, particularly from top clerics, to the system of clerical rule that was established after the 1979 Islamic revolution by the revolutionary leader, Ayatollah Ruhollah Khomeini. Iran has an elected president and Parliament, but final authority lies with the supreme leader, currently Ayatollah Ali Khamenei. Iranian authorities had charged Ayatollah Boroujerdi with lacking sufficiently senior religious credentials to speak out on the matter. They also accused him of sacrilege. He had been summoned over a month ago to the Special Court for the Clergy, but refused to surrender. TEHERAN -- Iran has arrested a controversial cleric and some of his followers who advocate separating religion and politics, a taboo in Islamic Iran, after clashes with police, the student ISNA agency said on Sunday. Hundreds of supporters of Ayatollah Mohammad Kazemeini Borujerdi had gathered on Saturday around his house in Teheran to protest the arrest of a number of the Shiite cleric�s followers and restrictions imposed on him, press reports said. �The ones behind Saturday�s unrest were arrested. All including, Mr Borujerdi, have been handed over to judiciary officials,� said a security official in Teheran governor�s office, identified only by his last name, Roshan. �They even (for a time) took members of the force hostage and threw acid on policemen and vandalized public property,� he said, adding �calm has been restored� in the crowded neighborhood in downtown Teheran. A report in reformist Hambastegi daily said the Special Court for Clergy had recently tried to arrest Borujerdi but faced by resistance by his supporters. Questioning a pillar of the Islamic republic, the ayatollah has said �we believe people have grown tired of political religion and they want to return to traditional religion. �The objective of my followers and me is in defending traditional religion,� the semi-official ILNA news agency quoted the ayatollah as saying. But the deputy head of Teheran police, Commander Nasser Shabani, accused the ayatollah of claiming to be the representative of the Shiites� �hidden� twelfth Imam, Mahdi, and misinterpreting religion. �A person has gathered some naive people around to pledge donations and have their wishes come true, which is a sheer lie and distortion of religion,� he told ILNA. The protesters were reportedly shouting slogans such as �religious freedom is our right� and �freedom is our undeniable right�, and carried banners that said �we are ready to be martyred to defend traditional religion�. His aims breach a taboo in Islamic Iran � a theocracy in which the all-powerful supreme leader is a cleric chosen by a top Shiite clerical assembly. A large number of key positions in Iran are taken by clerics, such as the head of the judiciary and members of the non-elected watchdog body, the Guardians Council, which vets all legislation and candidates for public office. Iran: Judiciary Orders Ban on Torture, But Why Now, And Will It Have Any Effect? Iran's conservative judiciary has banned the use of torture. The timing of the announcement is not clear, but many observers are calling it a tacit acknowledgement that torture is used in the Islamic Republic. Prague, 29 April 2004 (RFE/RL) -- Kianoosh Sanjari is an Iranian student activist who has been arrested and incarcerated several times in the last several years. Sanjari told RFE/RL he was subjected to psychological torture while incarcerated. Iranian authorities have always denied the maltreatment of prisoners and the use of torture. Human rights organizations say torture is prevalent in the country's prisons. In its latest report on Iran, Amnesty International said, "torture and ill-treatment, including of prisoners of conscience, continued to be used, usually in cases where judicial or security officials denied detainees access to lawyers and relatives." Human Rights Watch said the "routine lack of respect for basic due process, as well as the frequent use of solitary confinement and prolonged interrogations, heighten the risk of torture and ill-treatment in detention." Sanjari said many of those arrested during the 1999 student unrest were beaten. "I was a witness to the beatings in jail," he said. "Many of the students who were arrested in the aftermath of the student unrest in 1999 were lashed on their feet. For example, [well-known activist] Ahmad Batebi's head was held in a toilet. Consequently, many of the students are suffering even today from numerous infections." "Until all jails are under the control of the prison organization, we will not witness the real implementation of the judiciary's directive." -- SanjariYesterday, the head of Iran's hard-line judiciary ordered a ban on the use of torture. In a 15-point directive to police, intelligence, and judicial officials, the head of Iran's judiciary, Ayatollah Mahmud Hashemi-Shahrudi, said, "Any torture to extract confessions is banned, and the confessions extracted through torture are not legitimate and legal." The directive says that police should avoid blindfolding, restraining, or harassing detainees. Those accused of crimes also should have access to a lawyer. Mohammad Hossein Aghassi, a lawyer based in Tehran, told Radio Farda correspondent Siavash Ardalan that the directive is a tacit admission that torture exists in Iran's prisons. "The issuing of this directive indicates that such events happen throughout the country. Before it was said that torture did not exist, the constitution had banned it, and Islamic law is also opposed to it. And now the details we see in the directive are exactly issues that critics have been pointing out. On the other side, [the authorities] have always denied [the allegations about torture]. They closed many of the publications and newspapers because they had said, 'Yes, there is torture [in Iran]," Aghassi said. The timing of the directive is not clear. Some observers believe Iran's conservative judiciary may be trying to portray itself in a better light following the victory of conservatives in Iran's recent parliamentary polls. Vice President Mohammad Ali Abtahi was quoted by Iranian newspapers as saying the directive should be welcomed "if, in the future, it is observed in Iran's judicial system and prisons." But rights activists in Iran believe there is little hope that the order will actually stop the use of torture. "The existing laws are a better deterrent against the use of torture and maltreatment [of prisoners] than a simple directive. People who commit such acts do so secretly, and prisoners will not be released until such time that the signs of the beatings and harassment fade away. I think the directive serves more a propaganda purpose than a functional one," Aghassi said. Student activist Sanjari also expresses doubt that the judiciary's directive will be implemented in all of the Islamic Republic's prisons. "[The authorities] have numerous prisons which are not under the control of the prison [authorities]. For example, I was held in solitary confinement for three months in 2001 in the Revolutionary Guard's Prison 59," he said. "Torture was used there, but the officials from the prison organization did not respond [about my whereabouts] to my family. Until all jails are under the control of the prison organization, we will not witness the real implementation of the judiciary's directive." Currently, some 20 political prisoners are believed to be in detention in Tehran's notorious Evin prison. Human rights activists say a number of government critics and dissidents are also being held in other cities. Earlier this week, Iran's reformist President Mohammad Khatami for the first time publicly acknowledged that some are being held in the Islamic Republic for their beliefs. The news has finally caught up with the ongoing saga of the Ayatollah Hossein Kazemeini Boroujerdi, who has been challenging the legitimacy of the Iranian mullahcracy for many years. Both he and his father who died 4 years ago, and whose grave has been desecrated refused to embrace the Khomeinist doctrine that only a Shiite sage was fit to govern the Islamic Republic. The Boroujerdis retained the traditional Shiite view the one famously held by Ayatollah Sistani in Iraq that clerics should stay out of government and tend to their flock. Anyone who acts against the most fundamental doctrine of the Iranian clerical fascist state is going to have a lot of trouble, and Ayatollah Boroujerdi has had plenty of it. He has been in and out of prison, and repeatedly in front of the Special Court for the Clergy, since 1994. According to Amnesty International, he has reportedly developed heart and kidney problems as a result of torture. His latest round of defiance seems to have started in late June, when he preached to a large crowd in a Tehran sports stadium. A month later, on July 30th, the secret police came to his house, apparently to arrest him. But they found that he was protected by scores of supporters, so they arrested some of them instead. According to Amnesty, one of them had a heart attack and was moved to a nearby hospital. And another said that he was arrested at his home and dragged off to three weeks of solitary confinement and daily threats. They tried again on August 3rd, and were again driven off by his defenders. A month later, Boroujerdi was visited by a government agent, and a tape recording of that conversation has been smuggled out of Iran . It was made available to me by Banafsheh Zand Bonazzi, a leading Iranian-American activist who lives in New York City . The security agent told the Ayatollah that he, too, was a religious man, having attended a seminary after the revolution. He says that his visit is a kind of courtesy call, offering Boroujerdi the chance to surrender in a civilized way and then face trial. There is no escape possible, he says, for one way or another Boroujerdi will face charges of insulting the government and the clerisy, and perhaps even having been an accomplice to murder. Boroujerdi will have none of this. He says that he has already prepared himself for martyrdom (and indeed when he was arrested on Sunday, he was wearing a funeral shroud). He tells the agent that he has already suffered a heart attack, and that he will now contact the foreign press. This enrages the agent, who warns Boroujerdi that no place will be safe for him, even the mosque. He brags that Boroujerdi�s father was murdered, and says that he doesnt give a damn about the foreign press, which he calls meaningless. Boroujerdi did indeed contact the media, but you may have noticed there wasnt much coverage until the past few days. Amnestys press release was dated October 3rd, and there was little coverage of it. He also wrote to such world leaders as Kofi Annan and Javier Solana, to their apparent indifference. The secret police came again for Boroujerdi on the morning of September 28th, again found he was defended, and again dragged off many of his supporters. In its press release five days later, Amnesty demonstrated its celebrated droll sense of humor, writing that there are fears that the Ayatollah may be at risk of imminent arrest. But at least they wrote. Boroujerdi was dragged off to his destiny on Sunday, in a dramatic confrontation that involved thousands of demonstrators, some in Tehran , and some on the road to Qom , where many of the countrys most prestigious religious schools and scholars are located. The official news media reported that more than two hundred supporters were arrested at the house in Tehran , but this is the least of it. Two Iranian friends in Europe, and one in the United States , have received reports that speak of more than seven hundred people murdered on the road to Qom . If that, or anything approaching it, is true, it testifies to two important facts. The first is the truly vicious and totalitarian nature of this regime, which will stop at nothing to silence any sign of criticism from the Iranian people. Somebody should tell Richard Armitage about this, since he has yet to announce any second thoughts about his infamous claim that Iran is a kind of democracy. The second fact is widely, in fact compulsively, denied by a plethora of self-proclaimed experts on Iran . And that is the bravery of Iranians who wish to be free to practice their religion and politics as they see fit, rather than as their tyrants insist. Thousands of people stood up to the regimes killers, in defense of a solitary mullah whose crime was to preach traditional Shiite values. Thats a major event, especially because Islam is not very popular these days in Iran . Just a couple of months ago an Iranian ayatollah told me that it was not unusual to find the central mosque in major cities like Shiraz and Tabriz virtually empty for Friday prayers. He said that a grand total of five people had shown up in Tabriz one Friday. I doubt most of those poor souls were protecting Boroujerdi out of religious conviction. I think most of them were using his protest to challenge the regime for political reasons, because they wish to be free. There are tens of millions of these people, awaiting their moment and searching for their leaders. If thousands risked their lives for an unpopular cause simply because it was a way to stick their thumbs in the mullahs eyes, imagine how many would take similar risks if they received the political support we have been promising, but failing to deliver, for so many years now. Michael Ledeen - the historian and Freedom Scholar at the American Enterprise Institute - writes frequently for Pajamas Medias Politics Central. UPDATE: I am now being told that the death figure is way too high, as I rather expected, and the most recent details also confirm my suspicion that a lot of the demonstrators�of whom there were indeed many thousands, both in Tehran and on the road to Qom�were not just defending a popular Ayatollah. Most of the people on the highway were protesting the skyrocketing inflation that has taken place under Ahmadi-Nezhad. The regular security forces (revolutionary guards) were unable to clear the road, since people from various town joined the original protest. There was a very violent confrontation when RG special units were called in. Hundreds were arrested, many are hospitalized, including five RGs, who are in critical condition. I�ll have more accurate death figures in another day or two, but I wanted to make this correction quickly. Due to very difficult circumstances of freedom-loving Iranian people for freeing their homeland from Islamic Fascists, lack of real support network and undelivered promises in past for FREE Iran, Free Society and Secular democracy from �., The freedom-loving Iranian people resistance movement against Islamic Fascists inside Iran should enter the phase of organizing themselves as individual or in small groups of 3 to 5 individuals secret cells and avoid creating very connected large organization with single leader or leadership council or hierarchy that can be brought them down by Islamic Fascists Security Forces�.. and based on nature of these cells activities and specialties should avoid to become public and be exposed as long as possible to avoid arrest and executions by Islamic Fascists with vast Oil Money resources and traitor security forces�. these cells must have flexibilities to adapt to new circumstances and unexpected events because the external events can not be predicted very easily and avoid setup protest and NGO traps by Islamic Fascists security forces. Always hit your enemy with the element of surprise where they don�t expect �. 3. The "War on Terror" which is a subset of "War on Taazi" UNWINNABLE and the world peace can not be achieved as long as the Unelected Taazi Islamists Terror and Torture Masters are in power in Iran. The TAAZI terror state and fear society can not create peace and stability. 4. Iranian people can decide about Nuclear Energy, Nuclear Research and Atomic Bomb after the regime change when they have established stable secular democracy and FREE society until then Iran should avoid any kind of Nuclear research program, resulting to acquire Atomic Bomb, under Islamist Taazi occupation and control. 5. Territorial integrity and national sovereignty of Iran. 6. Complete separation of religion from the State. 7. Acceptance of the Universal Declaration of Human Rights. 8. Free, open and democratic referendum to elect the type of the new Government of Iran in the post-IRI era. 9. Minimum standard of living for all citizens of Iran and equal opportunity for all citizens to benefit from country's national wealth. 10. Work within high standard of code of ethics not to fight with other political groups or fellow FREE Iran Activists unless they are violating one of the key principles or moving against the concept of Free Society and secular democracy. [b]Despite the fact that ActivistChat has nothing in common with Ayatollah Boroujerdi, this recent event has proved the truly vicious and totalitarian nature of the Islamic Fascists occupiers of Iran that has 0 tolerances even towards their own fellow clerics, this might be good lesson for those G8 countries that acting as blinds and def to open their eyes to the reality after 27 years appeasing. According to unconfirmed report by Dr. Michael Ledeen �that speak of more than seven hundred people murdered on the road to Qom ...� This is another indication that D�tente with Islamic Fascists is the EU3, China and Russia illusion and far from reality. ??? According to received reports, esteemed activist and blogger, Kianoosh Sanjari is now officially known to be detained in the notorious ward 209 of Evin prison which is the section belonging to the torturers and agents of the ministry of intelligence and security. Reportedly, the prison guards refuse him blankets and continue to reiterate to him that: �This time we�re not going to let you get away�. He is brought out of his solitary confinement several times a day under the guise of being taken to interrogation; however it is for nothing more than continued beatings and harassment. My grandfather was A wise man. He fought in WWII against the evil Nazi power and had many stories that he handed down to me before he died. He always reminded me of the horror that men do when power and money were in threat of being taken away. 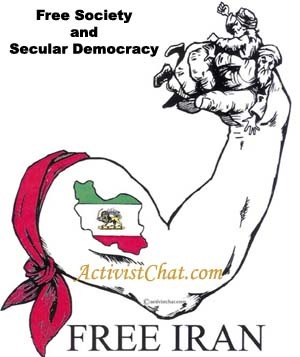 There are men in Iran that know the mixing of religion and government is folly! Allah bless them and their bravery! To oppose the ruling body of Iran is at best A death sentence...this is A clear sign that the Mullah are in fear of losing control and indeed they are! "Nothing is more dangerous than an animal when it is wounded!" What I have learned from my wiser elder is the actual acts A wounded animal will do at its last breath and this is what I fear most for the innocent men,women and children in the beautiful country if Iran...my prayers are with all of you at all times!!! More people in Iran will stand up and resist and I stand up with them!!! Men that believe women are property to be handled as they see fit are ignorant, small minded fools! !